Second Lieutenant, Royal Flying Corps. Brighton College Register: Son of W.J. Waterfall of Burgess Hill. Grave Reference: IIIG4 Tournai Cemetery, Hainaut, Belgium. The very first two British officers to be killed in WW1 were 2nd Lt. Vincent Waterfall who had qualified as a pilot from the Royal Aero Club (RAC) in 1913 and Lt. Charles George Gordon Bayly of St Pauls. On August 22nd the two young RFC officers were undertaking an observation flight over Belgium to confirm rumours of German troops marching towards the BEF troops stationed at Mons. They flew too close to the Germans and were shot down in action. A donation to the memorial statue has been made in honour of this soldier by the family of Louis de Wardt (Head's House 2014-present). AND ANOTHER DONATION IN HONOUR OF THIS SOLDIER by BRIGHTON COLLEGE CCF, AND Paul, Sarah, Toby and Lois Wilson. Vincent Waterfall was born on the 25th May 1891 in Grimsby, Lincolnshire, England. He was the son of Walter Frank Waterfall (1847-1915), whose occupation is not known, and Mary Anne (née Figgins) Waterfall (1849-1927). Waterfall was one of 8 brothers and two sisters in what was, even by the standards of the time, a large family. During Waterfall’s childhood the family moved down to Burgess Hill in Sussex where they lived in ‘Langdene’, 94 Mill Road, which was demolished as recently as 2005 to make way for a close of houses. However that may not have been the family’s only residence in Sussex because during Waterfall’s time at Brighton College his address was in fact listed as 1, Belvedere Terrace, Brighton. The reasons for the move South appear to have been ill-health on the part of Waterfall’s father Vincent. Waterfall was educated at Brighton College (Chichester and Hampden) between 1907 and 1909. For a pupil who was to have such a notable, if sadly foreshortened life, surprisingly little appears in the school records about his time at the school apart from the fact that, as might be expected given his subsequent career, he was a Corporal in the OTC. However, surviving relatives report that he was known from an early age to be ‘quite a socialite [who] excelled in many sports and was quite highly regarded as a young man’. On leaving the school Waterfall passed through the RMC Sandhurst before receiving a commission in the East Yorkshire Regiment on 26th January 1912. It appears to have been around this time that he developed an interest in flying which was to take his military career in a different direction and ultimately lead to him becoming an important, if tragic, footnote in the military history of the United Kingdom. 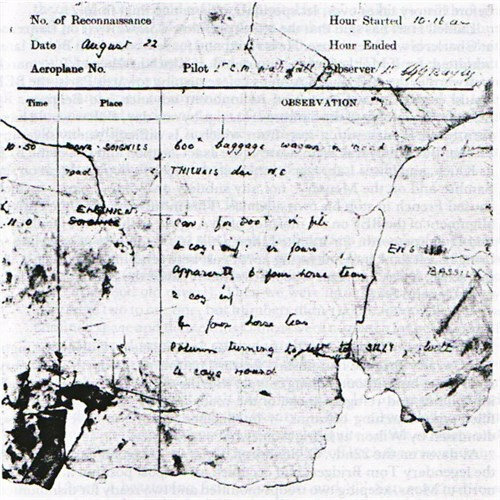 On 22nd April 1913, while still a serving officer, he obtained his Flying Certificate, effectively a pilot’s license, at Vickers Flying School, Brooklands and it must have been at similar point that he was seconded from the East Yorkshire Regiment to the nascent Royal Flying Corps, then a very small branch of the army whose role in warfare was as yet untested. A picture emerges of Waterfall in this period as being something of a maverick very much in keeping with the general image of the early pilots. He won a Silver cup in the Brooklands speed-flying competition and was known as a “dab-hand” at flying the extremely flimsy, and presumably distinctly unsafe, Martin-Handysde Monoplane. There is also a very amusing report in the Surrey Mirror dated 14th July 1914, just three weeks before war broke out and only six weeks before his death, which records his prosecution for driving a motor car at the then outrageous speed of 30 mph. The Chairman of the Magistrates rather pompously warned that he was ‘evidently careless and if you are as careless in your flying it may cost you your life’ before fining him £2 plus costs (equivalent to about £200 today). 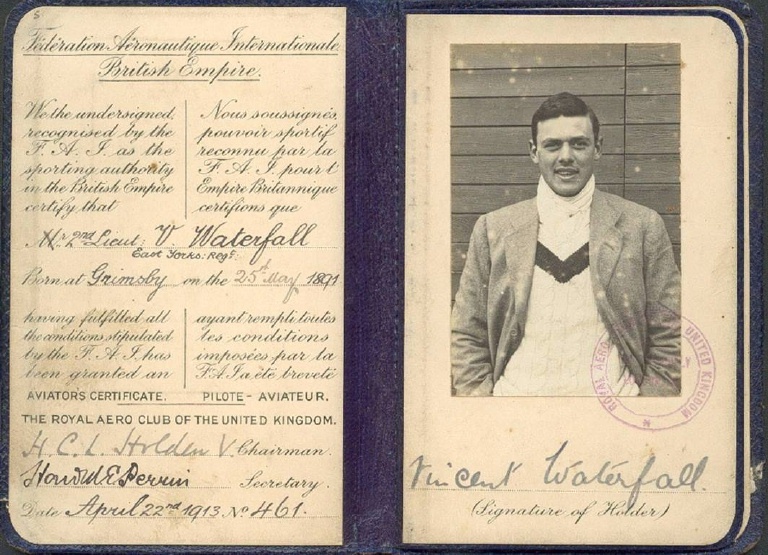 On the outbreak of war Waterfall was serving with the 5th Squadron Royal Flying Corps which was based from 15th August 1914 in Mauberge, France. At the point in the war the sole role of the Flying Corps was reconnaissance but in the context of the fast moving German invasion of France and Belgium, the famous right-hook envisaged in the Schliffen Plan, this was very important. In this context, in the early hours of the 22nd August 1914, Waterfall flew his first wartime reconnaissance mission which accurately reported that a body of German troops was on the Mons-Soigne Road and turning towards Silly. This movement was in fact the opening stages of the now famous Battle of Mons which started the BEF’s active engagement with their German opponents during the First World War. The crash was also observed by a fourteen year-old Belgian boy, Hector Durand who had been ordered to deliver grain to the advancing German cavalry. Durand reported that a group of about 13 German troops was initially so surprised that they did not shoot at the plane which approached them at a very low level. However, eventually, after receiving orders from an officer, they did so as the plane was entering a turn. After the plane fell from the sky, the smouldering wreckage remained on the ground for some time and as the vast numbers of advancing German troops passed by they removed their hats and saluted. The Germans were certainly very intrigued by what was the first British plane they had shot down in combat because in a photograph taken at the scene there is a large crowd of German soldiers surrounding the wreckage, amongst which the dead bodies of the Waterfall and Bayly are clearly visible. However the most detailed account of Waterfall’s death and subsequent burial, which presents a contrasting account of how the Germans behaved in rather colourful but slightly broken English, was written by the local Belgian parish priest, Monsignor Kindt, in a letter to Waterfall’s sister in 1920. It was, therefore, written after the conclusion of the war in which the author had suffered four years of German occupation in the intervening period. 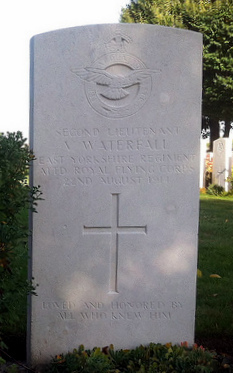 Lieutenant V. Waterfall, of the Royal Flying Corps, who has been killed in Belgium, was the youngest son of Mr. and Mrs. W. F. Waterfall, of Langdene, Burgess Hill, formerly of Derbyshire. He was 23 years of age, and a brother-in-law of Dr. Winkelried Williams, of Hove (Sussex). The King and Queen have forwarded a message of sympathy to Mr. and Mrs. Waterfall in their sad bereavement. Second Lieutenant Vincent Waterfall, of Langdene, Burgess Hill, whose death was recorded in our last issue, was gazetted to the 3rd Battalion of the East Yorkshire Regiment in January, 1912. He joined the Royal Flying Corps in July, 1914 for a course of instruction at Farnborough (Hampshire) and became a Flying Officer in August. In the current issue of 'The Aeroplane' is the following obituary notice: - "Mr. Waterfall will be remembered by many at Brooklands (Surrey) as a very promising pilot. He took his certificate No. 461, at the Vickers School, on April 23rd 1913, and afterwards flew on various machines, particularly doing some good flying on the Martin-Handasyde monoplane. Personally he was a fine specimen of the best type of English public school boy, and had the making of an officer of the very best class. His high spirits which were absolutely without harm to anybody, and his unfailing good nature, endeared him to all who knew him, and he will be greatly missed and deeply regretted by his many friends, who will join in tendering to the lady to whom he was engaged and to his relatives their deepest sympathy." 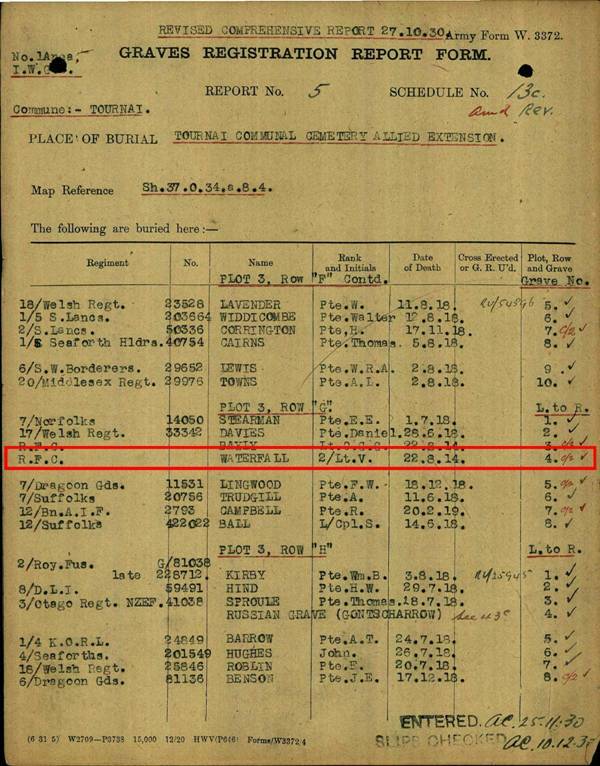 His body and that of Lieutenant C. G. Bayly were found by a Belgian at a place not stated, and were hidden so that they should not be found by the Germans."